This audio-visual collaboration between Portland-based avant-garde metal outfit, The Body, and NYC mixed media artist Alexander Barton has been a long time coming, a homage to an enduring friendship. Combining their mutual shared interest in intensity, abstraction, and religious themes, the music video for “To Attempt Oneness” pits The Body’s guttural, distorted screams and noisy, rumbling guitars against Barton’s bleeding ink painting — an extension of his earlier performance which used real pig’s blood. The final product holds a viewer’s fascination with its impressively slow and minimal unfolding, the most entertaining way possible to watch paint dry. To celebrate the very recent release of The Body’s Christs, Redeemers on Thrill Jockey Records, we offer you a side-by-side interview with artist Alexander Barton and The Body’s drummer Lee Buford, as they speak of music, aesthetics, and the world. The Body are currently on a nation-wide tour; dates at the bottom of this post. “How did the collaboration first come to form, and how much a creative exchange of ideas was there? We’ve been friends with Alex for about 10 years and we used to live together up until the point he moved to NYC, so it was kind of inevitable we’d do something together at some point. He’s played on other records we’ve done and designed shirts for us so this is a pretty organic step as far as collaborating. The Body’s catalog bears the talents of many friends, lovers, dwellings, area codes, ideals, and economies. [Guitarist and vocalist] Chip [King] and [drummer] Lee [Buford] truly entrust and depend on the people they choose to collaborate with, which seems to create an authentic collection of work. In Providence, we lived and worked together on projects for many years, so we know what to expect from each other. I heard the new material and saw an opportunity for us to kill a congregation of birds with one stone. How was it decided that the idea of “Blood Reflects” would provide the groundwork for this video? That was Alex’s idea. He wanted to do another version of it, and I guess thought our song was fitting. Almost immediately after my initial Blood Reflects performance, I wanted to make a new piece that exposed the process a little more crudely. I was confident that one of their new tracks would be an appropriate score to this edition. With no more than three text messages, Lee confirmed a release date. 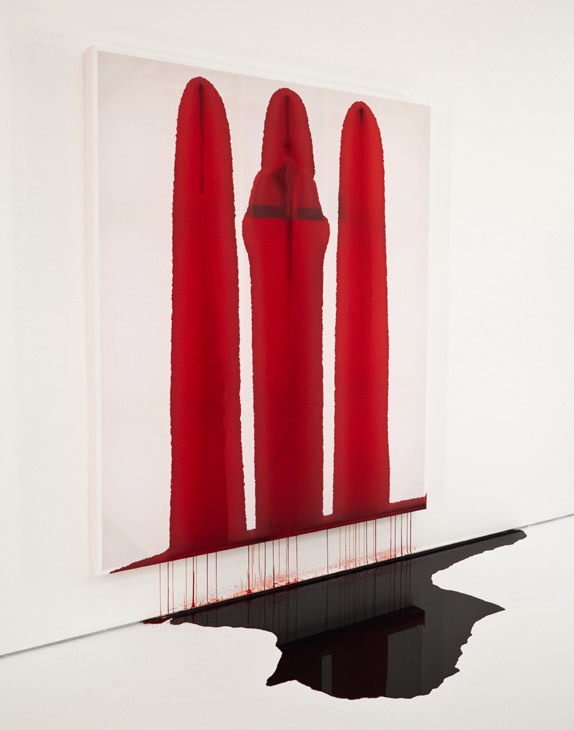 Alexander Barton – Blood Reflects (The Bleeding Painting), 2012, V performance of swine blood on linen, 62″ x 70″. The Body’s record is called Christs, Redeemers; Alexander Barton’s related artist statement says, “A traditional white linen stretcher suddenly starts to trickle. Gallons gradually spill down onto the floor, creating sanguinary pools around the stained substrate. In this installation of spectatorial sacrifice and satire, the hemorrhaging mocks the visceral performance of Painting. Bleed for the artist, bleed for artists. Bloodlets. Blood Reflects.” Would you say there are any overlapping themes between the two works? I think there’s definite overlapping themes for sure. I think when you’re friends with someone so long it’s hard to tell who influences who. I think that’s what’s great about being friends with like-minded creative people; everyone kinda pushes everyone else to the same aesthetic goal. I developed the concept of a bleeding painting particularly to the accounts of “crying” statues of Mary or stigmata claims and the sacred phantasm and perversion earned from applying a “living” element to an artifice or dead object. Religious rubberneckers or art eaters alike: I wanted to create a spectacle. In these actions, I want reflection and I want to remove the “person”, especially the artist from the physical. My piece is slow, large, truncated, condemning and consuming; everything The Body aims for with sound. WEEPING STATUES are a topic of religious debate, as the phenomena are often reported by Christians and later proven to be hoaxes. Statues are said to supernaturally shed tears of human blood, oil, or scented liquids, and are sometimes associated with miraculous healing. Statues of the weeping Virgin Mary are the most common type reported and are often paired with apparition sightings; however, the Catholic church only recognizes a handful, while the Vatican itself only recognizes one. Weeping paintings are considered a related phenomenon. STIGMATA are marks, sores, and sensations of pain experienced by certain individuals, which allegedly correspond to the crucifixion wounds of Jesus Christ. Most commonly associated with bleeding hands, feet, and wrists or pain in those areas, stigmata can also include wounds similar to those left by Jesus’ Crown of Thorns, as well as the sweating or crying of blood. St. Francis of Assisi was the first recorded stigmatic in Christian history, and many others have followed. The majority of reported stigmatics are women and a large number are of Catholic religious orders. Modern scientific research generally considers stigmata of hysterical origin or linked to dissociative identity disorders. RIGHT: St. Pio of Pietrelcina suffered from stigmata for over 50 years. His wounds were studied by 20th-century physicians, who reached conclusions varied and inconclusive. Further reading can be found at TIME magazine here and here. Can you tell me a little bit about the mechanism used and how the materials for this piece were chosen? Why black and white, and why ink rather than blood? This one is all Alex. 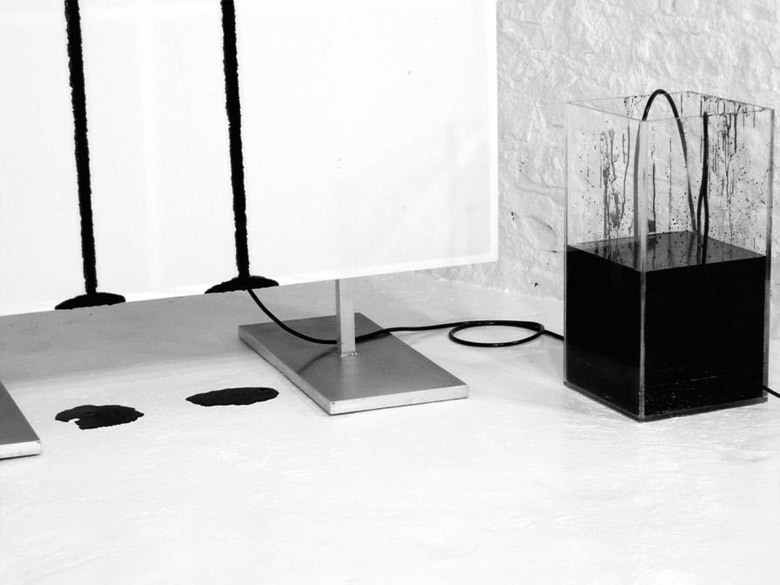 There are a grouping of objects here, and when they function together, they could personify the mixed materials: a clear basin full of black paint with a fountain pump pushing the paint through transparent tubes mounted to a stretcher, where the paint soaks through the linen and spills all over my studio. I often apply consecrated materials in my work, and I felt it was important for this piece to use traditional paint to directly apply to the formal culture of art-making. Regardless of the material, it will appear as “bleeding”. The black and white is a formal contrast and the strongest display of a void. I can also award influence from a scene from [George A.] Romero’s em>Night of the Living Dead, and [Stanley] Kubrick’s elevator scene in The Shining. 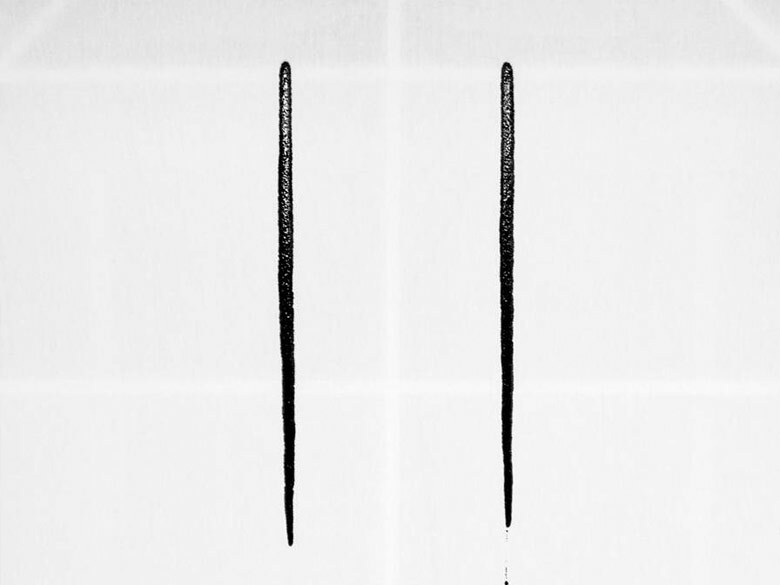 Do these types of experimental metal and minimalist art generally pair closely in your head? If so, why do you suppose that is? Do you have any other examples of similar associations and collaborations which seem successful to you? To me, it makes total sense. I don’t know if it’s because we’re biased because Alex is our good friend or what, but I think it matches perfectly. We collaborate a lot with our friends, and luckily it always turns out great. I have always had more success describing The Body’s music by drawing comparisons to Brutalism, Richard Serra, Robert Smithson or even Malevich, than to any metal band. It’s a pretty alienating parallel within the metal community to boot. They, like many experiments with noise and sound art, use sound qualities as a medium rather then as a fashion or whatever a pop song attempts at. I enjoy Minimalism because of the open-ended opportunity it gives a viewer to project onto the thing in front of them. A few sound pieces I appreciate not as a “collaboration” but as combining an object with a sound, would be David Byrne’s “Playing The Building”, and Prurient’s performance where he played guitar with a rock. The track is quite long at about seven minutes; how did the editing process work, and how did you address the question of how to create an interesting video with very little material? It was most important that the shots were absolute and the editing did not indulge the song. I upheld the linear integrity of the process and offered only the perspectives available during the performance that lasted about one hour in total. The video is only the documentation of a drip: A Bleeding Picture. 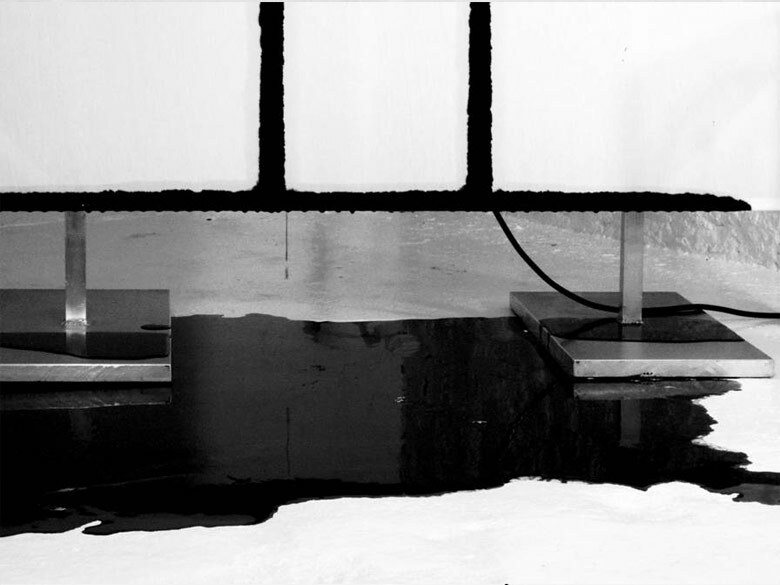 2013, black liquid on linen and mixed media, 56″ x 69″. Nov. 10th – Phoenix, AZ – Wall St.